Errrm, so I know I typically save my crushes until Friday, but I'm going on a little vacay and thus will be blissfully computer-less for the weekend...so I moved up the post as I've been itchin' to post this picture. 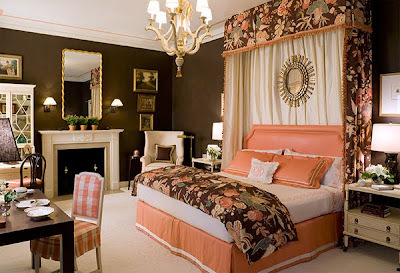 Do you know this to-die-for room designed by Kelley Proxmire? It has made the rounds in the blogosphere - as it should, it's so gorgeous. Proxmire will be one of the designers featured at this year's DC Design House - I did not meet her at the Bare Bones tour, but I caught a glimpse of her concept board and I'm sure the room will be gorgeous - can't wait to see it. As I said, I'll be out and about this weekend so sadly, I will not be back posting until Tuesday...parting is such sweet sorrow. Have a fabulous weekend...see you Tuesday! No post until Tuesday? I guess my employer will get two full of days of work out of me. I'll miss my morning eye-candy. Have a great trip. Thank you, Thank you we are so excited about her! i see why you couldnt wait on your crush for this one.. sooo gorgeous! I love all the gilt against that gorgeous chocolate. Yummy. Hope you had a great getaway, Daniela!